My Olympus Trip 35 (in the hands of my benefactor), originally uploaded by Headphonaught. I got a text today from a dear friend, Martin Bellshaw. 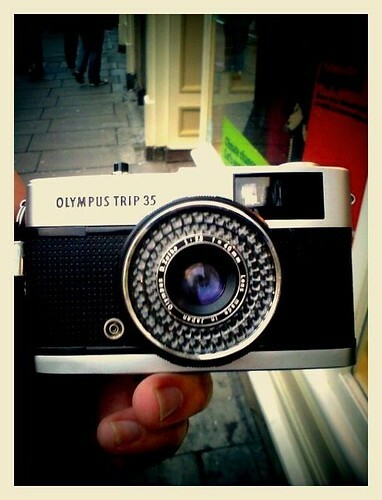 He was in a charityshop in Edinburgh... he had found an Olympus Trip 35 camera for £3... and wondered if I wanted it. Let's just say I jumped onto camerapedia then was very quickly back in touch. It was one of those "grab it now" moments in life... and for THREE QUID... omgoodness!!! Afterwards I was pretty stoked for 2 reasons... first off - I've got a new camera to play with... which is always good! and secondly - I liked the fact Martin saw it and thought of me. Made me feel all shiny inside.